Is there a reason that I exists? Or am I just the result of change? Why should I believe in God? Is there any real evidence? Is Jesus just a myth, or is he the Son of God? Is faith reasonable or just an anti-intellectual blind leap? Is a fulfilling, meaningful relationship with God possible? Questions like these prompted Don Bierle to begin his own search for meaning and purpose while still in college. At first, he was convinced that science would provide answers. But when science disappointed him, he began exploring spiritual options and was amazed by what he discovered about Christianity. In FaithSearch, Don invites you to retrace the steps he traveled on his own faith journey. You won't have to trash your brains on this venture. 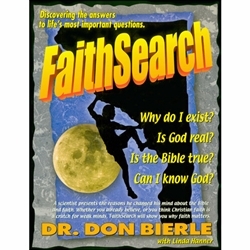 A great study guide for teens that invites them to use their heads in an investigation of Christianity and the Bible. Includes weekly and/or daily sections for individual or group study.